The perfect activity for exploring numbers! 1. Gather your material. 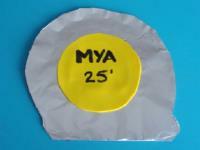 You will need aluminum paper, white glue and/or hot glue, a roll of yellow ribbon, a black marker (not shown), a scrap of yellow Fun Foam, two corks, two paper plates, scissors, and a ruler. 2. 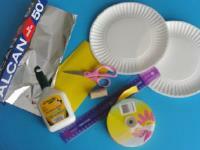 Place the two paper plates one on top of the other and cut two identical tape measure housing shapes. 3. 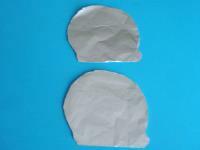 Wrap both shapes in aluminum paper. 4. 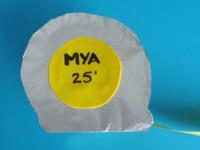 Cut a circle out of the yellow Fun Foam and glue it in the centre of one side of your tape measure housing. Write the child's name on the circle. 5. 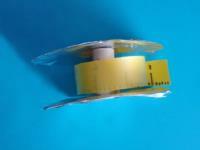 Cut a long piece of yellow ribbon (approx. 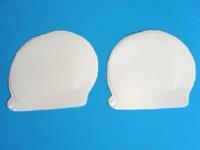 40 cm). 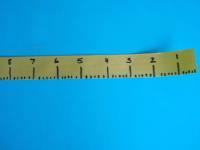 Use the black marker to create your tape measure by writing numbers and tiny lines from right to left. 6. 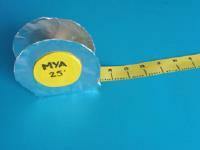 Glue the left end (the one with the larger number) of your measuring tape to a cork and glue the cork near the bottom of your tape measure housing as shown. Glue the second cork somewhat higher, almost in the centre of the housing. 7. 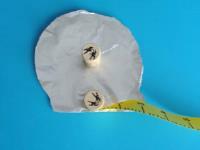 Glue the other side of your tape measure housing on the corks. 8. 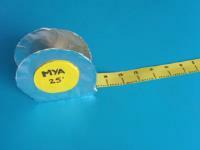 This will make it possible for your tape measure to remain upright on a table or the floor. 9. What's more, children can roll the ribbon around the corks when they aren't busy measuring items within your daycare or in your yard.